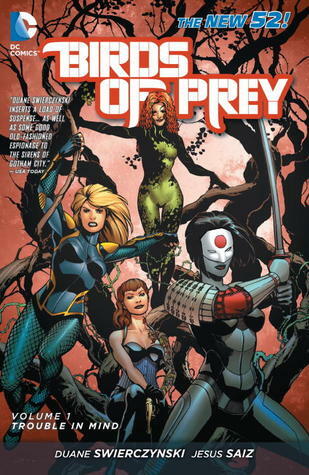 I first encountered the Birds of Prey in the live-action adaptation that starred Ashley Scott, Dina Meyer and Rachel Skarsten in the roles of Helena Wayne aka Huntress, Oracle and Dinah Lance’s daughter Dinah Redmond. It was a very short-lived show sadly, but it was a really good one for me. I’ve seen it at least three times in the last seven years, and though it had a fair few flaws, it still stands out for me. The acting was a huge draw for me, especially when the show brought in the fantastic Mia Sara as Dr. Harleen Quinzel, which was a brilliant move. 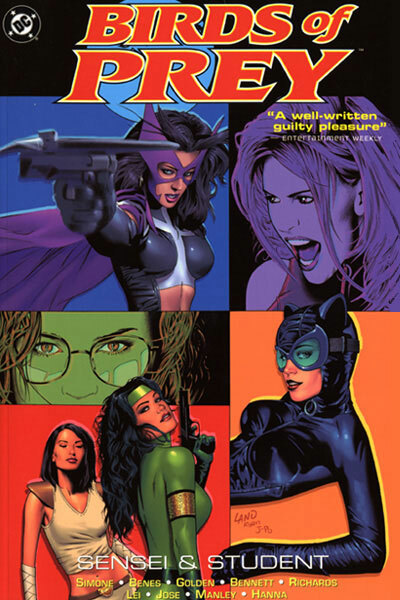 Last year I started reading the Birds of Prey comics from the current New 52 continuity (review of #0), written by Duane Swierczynski and drawn by Jesus Saiz. Duane’s run on the title, starring some favourite characters like Batgirl and Black Canary, along with some surprise ones like Poison Ivy and Katana, was pretty fantastic and when he departed the title earlier this year, I was quite sad to see him go All the unique choices that Duane made with the team, such as creating a new character Starling for the series and bringing in a villain like Poison Ivy, all worked out in the end. The Birds of Prey comics under his reign are some of my favourite New 52 comics. His replacement, Christy Marx hasn’t lived up to the same standards unfortunately and Romano Molenaar’s art hasn’t been all that good either. In January this year I experimented with Gail’s second run on the Birds of Prey from 2010-2011, before the DC universe was rebooted for the New 52, and I began to see an alternative to Duane that I liked just as much at the least, if not more. Gail’s version of the team from this era was huge, and seeing such a great who’s who list was a joy in its own way, something I’m not likely to forget. And then I started reading Gail and Ed’s first run on Birds of Prey from 2004, once writer Gilbert Hernandez and artist Casey Jones stepped off the title. I read Gail and Ed’s first two arcs (review) back to back in a single night and I was pretty amazed by just how good they were. Some of the best comics I’ve read to date and with better art than I expected. The magic I’d been looking for in the absence of Duane Swierczynski’s run was found in the older comics and Gail has been superb with the team and the characters. Gail’s strength is that she gets the little moments between her characters really well and in the interactions between Barbara and Dinah she’s done some of her best work, as far as I’m concerned. I love her current run on Batgirl and I love her The Movement and Red Sonja, but damn, these Birds of Prey comics are totally something else. And Ed Benes’ art, while not without its problems (some of them institutionalised from the art styles of the era), was damn good too. I’m a huge fan of Black Canary and the Huntress, so these comics gave me just what I wanted, visually speaking. So yes, that’s that. Just the other night I finished reading Gail and Ed’s third arc, which was just as good as their previous two. So great to see that there was such a consistency in the quality of the series in those days. Posted on December 28, 2013, in 12 Days of Best SFF Characters of 2013, Book Lists and tagged 12 Days of Best SFF Characters of 2013, Barbara Gordon, Batgirl, Birds of Prey, Black Canary, Book Lists, Comics, DC Comics, Dinah Lance, Duane Swierczynski, Ed Benes, Female Superheroes, Gail Simone, Helena Bertinelli, Huntress, Jesus Saiz, Katana, Lady Shiva, Oracle, Poison Ivy, Starling. Bookmark the permalink. Leave a comment.